Liverpool should keep Luis Suarez despite his ban, says the club's former director of football Damien Comolli, who helped sign the striker in 2011. The Uruguay forward, 27, has been suspended from all football for four months by Fifa for biting Italy's Giorgio Chiellini in a World Cup match. It is his third career ban for biting and his second while at Liverpool. Barcelona are interested in acquiring Suarez, but Comolli said he would "definitely" keep the player. Fifa's ban means Suarez is not allowed to enter a football stadium and train with his club or country. The forward was also banned for biting Chelsea's Branislav Ivanovic in April 2013 and PSV's Otman Bakkal while at Ajax in 2010. He will have missed a total of 39 matches because of these biting offences by the time he serves his latest suspension. Suarez helped fire Liverpool to a second-place finish in the Premier League with 31 goals last season. Comolli, who was instrumental in the £25m deal to sign Suarez in January 2011, told BBC Radio 5 live: "Who do you replace him with? There is nobody like him around. If there was, Real Madrid and Barcelona would go after them and not Suarez." Former Tottenham and Saint-Etienne sporting director Comolli also warned that rival clubs could use Suarez's ban to negotiate a cut-price deal. He said: "If there was a buying club and they felt Liverpool would sell, they will take advantage and try to drive the price down." 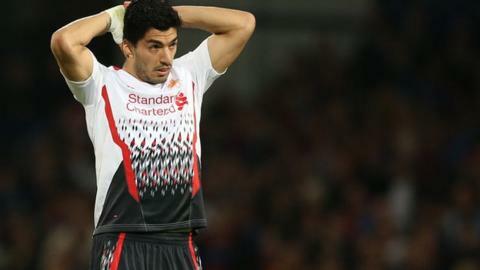 Suarez signed a new four-and-a-half-year contract at Anfield in December last year.